With the release of Mac OS X 10.7 Lion this summer, Apple will make the switch to a new kind of digital distribution for its operating system upgrades by releasing the software first through its new Mac App Store, AppleInsider has learned. The Mac App Store, available to all users running the most recent version of Mac OS X 10.6 Snow Leopard, will become the de facto method for obtaining the Lion upgrade, people familiar with the matter have revealed. Users will be able to upgrade instantly without the need for physical media by purchasing Lion through the Mac App Store. While the Mac App Store will be the preferred method for installing Mac OS X 10.7 Lion, set for release this summer, it's logical to presume that Apple will also offer an optical disc for people who may not have broadband. At least person with knowledge of the situation claims that this will indeed be the case "for those with slower connections, or [for those who for whatever reason do] not want to download it." Apple will likely reveal its distribution plans for Lion at this year's Worldwide Developers Conference in San Francisco, Calif., set to take place June 6 through 10. Apple has promised that this year's conference will showcase the "future" of the Mac operating system, and will be an event developers will not want to miss. Evidence that Lion will be available in the Mac App Store can already be found in the pre-release builds Apple has issued to developers. Betas are downloaded from the Mac App Store by entering a redemption code provided by Apple. Utilizing the App Store will allow owners of the new disc-drive-less MacBook Air to easily install the latest version of Mac OS X without the need for a physical disc. Apple ships its redesigned MacBook Air with a Mac OS X 10.6 Snow Leopard reinstaller on a USB thumb drive, rather than a DVD. Making the App Store a central component of the Mac experience will also allow Apple to remove disc drives from future hardware as the company looks toward a future of computing without the need for physical media. Removal of SuperDrives from devices like the MacBook Pro is expected to take place over the next 12-18 months, paving the way for even thinner designs with more internal space for a larger battery. Apple has even moved to limit shelf space for software in its retail stores, allowing greater room for more profitable hardware to be sold. In February, it was rumored that the company actually plans to cease the sale of all boxed software at its retail locations. The App Store has even been highlighted by Apple as a defining feature of Lion, which is due to be released this summer. 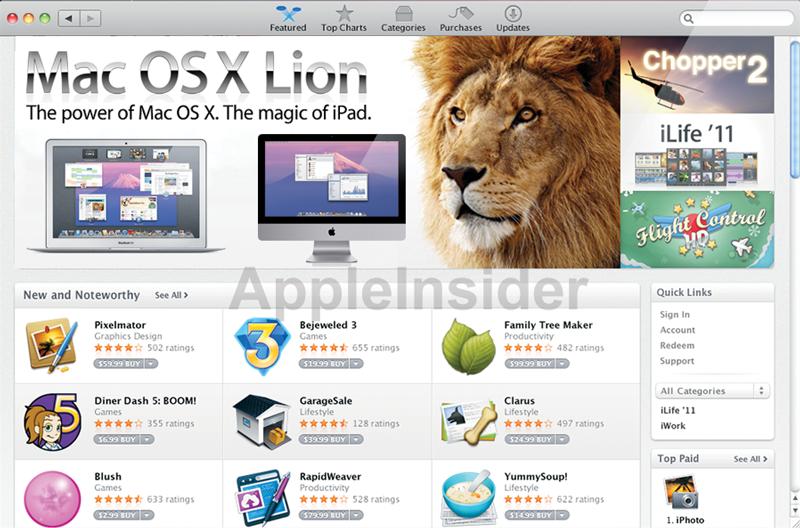 But rather than wait for the release of Lion, Apple opted to bring the Mac App Store to Snow Leopard users in January. Hardware requirements for the Mac App Store are the same as those for Snow Leopard, including an Intel-based processor, 1GB of system RAM, and 5GB of available disk space. But those with Apple's earliest Intel-based machines will not be able to run Lion, as it has a minimum requirement of a Core 2 Duo processor.